A journalist recounts her risks, fears and triumphs. Author of 16 books, Vanity Fair contributing editor Sheehy (Passages in Caregiving, 2010, etc.) has made a career out of examining life stages. Passages (1976) stayed on the New York Times’ best-seller list for three years, followed by Silent Passage (1993), New Passages (1995) and Understanding Men’s Passages (1999). Passages in Caregiving was motivated by the last illness of her husband, publisher Clay Felker; now, she reflects on her own transitions in a brisk, gossipy narrative complete with handsome hero (Felker), villain (Rupert Murdoch), nail-biting adventures (Bloody Sunday, for one), scores of celebrities (including interview subjects Hillary Clinton, Margaret Thatcher, Bobby Kennedy and Anwar Sadat) and famous friends (Gloria Steinem, Tom Wolfe and David Frost). Like Wolfe, Sheehy is a practitioner of New Journalism. “We treated the protagonists of nonfiction stories like characters in a novel,” writes Sheehy. “What was their motivation?...What was it like living inside their reality?” The author reprises her own reality in three parts: the Pygmalion Years, when she was a young, ambitious journalist trying to establish her reputation and overcome editors’ prejudices about women writers, whom they commonly assigned to stories about food and style; the Passages Years, when she was a star writer for, among many other venues, Felker’s New York magazine, Helen Gurley Brown’s Cosmopolitan and Tina Brown’s Vanity Fair; and the Bonus Years, focused on Felker’s cancer and Sheehy’s gradual recovery from alcohol abuse and depression following his death. After Passages, Sheehy felt she had to “justify” that success with “an academic-level study.” The result was Pathfinders (1981), about people who risked “choosing the less-traveled path.” Raising a daughter on her own, adopting a Cambodian girl after visiting a refugee camp and helping to found the Women’s Refugee Commission to advocate for survivors of genocide are among many reasons—aside from her career choices—why Sheehy, too, is one of those audacious pathfinders. 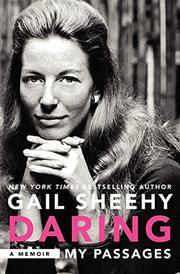 Daring, the author amply shows in this spirited life story, defines her.